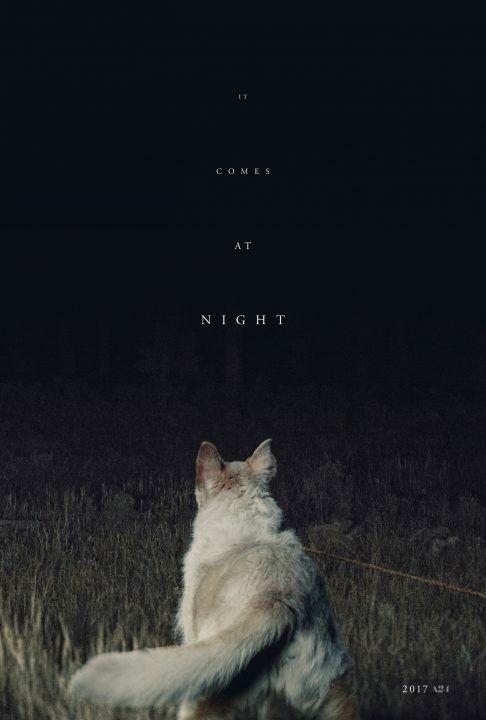 The building blocks of It Comes at Night is made up of paranoia and fear. This cocktail can be paralyzing especially when it comes to protecting one’s family in response to a deadly virus that is killing people just by breathing in the air. It sounds run of the mill, but what’s frightening about this film is what we do or do not know about what’s behind the red door. The film opens to black with only the sound of the faintest breathing. We see an emaciated old man with boils and bruises. He is on the precipice of becoming something different. A zombie perhaps? The audience doesn’t know. We do know that Joel (Paul Edgerton) and his teenage son, Travis (Kelvin Harrison Jr.) must take him out, like old yeller, and then burn his corpse. Travis, who holds the moral compass, doesn’t know exactly how to cope with this and his imagination runs wild. Along with his wife, Sarah (Carmen Ejogo), the three are living holed up in a cabin at least 50 miles from anyone else, or so they think. Will (Christopher Abbott) comes crashing through the red door which is what keeps the family safe from whatever is lurking in the dark. Out of necessity of bartering, Paul welcomes Will and his family into his home. The trust is strained at best with both families trying to keep it together in the reality of the world they now live in together. A film about survivalists. It’s almost reminiscent of the game The Last of Us (PS3/PS4). Not a shocking type of horror film, but more about how a family might react overreact with signs of the apocalypse. It Comes at Night is almost too quiet for comfort. A lot of reading between the lines and coming up with some sort of machination, perhaps not completely dissimilar to what it might be like to have to ration food, be paranoid of others getting sick, and spreading the disease. Is there actually a disease out in the open killing people? Again, the audience is never let in on too much about the plague or what is causing the sickness, but the mystery adds to the tension and helps it go from goodness to greatness.